Uganda's long-time president Yoweri Museveni, 71, center left, receives a shield as a symbol of power from Chief Justice Bart Katureebe, right, as his wife Janet Museveni, left, looks on during an inauguration ceremony in the capital Kampala, May 12, 2016. U.S., Canadian and European delegates walked out of the Ugandan presidential inauguration ceremony Thursday in response to the presence of an indicted war crimes suspect and remarks by President Yoweri Museveni disparaging the International Criminal Court. The U.S. State Department said Thursday that the U.S. delegation walked out of the ceremony in Kampala, which was attended by Sudanese President Omar al-Bashir, who has been indicted by the international court in The Hague for genocide and crimes against humanity in Sudan's war-ravaged Darfur region. State Department spokeswoman Elizabeth Trudeau said the U.S. is "concerned that President Bashir has been able to travel to Uganda." Uganda is a member of the ICC and is supposed to detain and turn over to the court any indicted suspects on its soil. But in his speech Thursday, Museveni openly voiced his disdain for the court. Speaking to a number of African heads of state and delegations from other nations, Museveni said he no longer supports the court, calling it "a bunch of useless people." At those remarks, the U.S., European and Canadian officials left the ceremony. Thursday was Museveni's fifth swearing-in. He has been in power since 1986. Supporters decked out in yellow — the color of the ruling party — gathered at Uganda's Kololo Airstrip to greet the president before the ceremony. 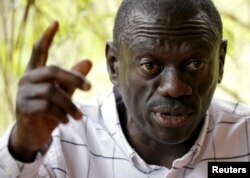 FILE - Opposition leader Kizza Besigye speaks during a news conference at his home at the outskirts of Kampala, Uganda, Feb. 21, 2016. "We came on the bus, we are too excited," said one supporter, who traveled from Karamoja, nearly 500 kilometers away. "We are big supporters, and we shall need him again for the next term." Museveni arrived amid a chorus of cheers, and within the hour he was sworn into office. But the celebration took place against a backdrop of tension. The government cut all social media the day before the inauguration, and police were out in force in downtown Kampala, after unrest Wednesday. Opposition leader Kizza Besiyge had managed to escape house arrest and make a surprise appearance in town. He vowed to continue his campaign of defiance as the "people's president." Supporters flocked to see him. Police fired tear gas to disperse the crowd and began beating civilians, according to witnesses and videos posted on social media. "They [police] find us when we were closing the shop, they told us you close your shop and we go," said one shopkeeper who was beaten. He said people panicked and ran to nearby buildings. "Then they started caning, seriously, without something to do ... men and women, anyone that entered into the building. Now what should we do?" he said. Besigye finished second in the February vote, but has called for an independent audit of results that saw Museveni win 61 percent of the votes. The opposition FDC party said it held its own inauguration for Besiyge, tweeting a video of the event Wednesday. Shortly after, the government cut social media access in the country. This is the second time a social media blackout has been enforced. The first time was during the Feb. 18 poll, though many got around it using VPN, or virtual private network. Before the inauguration, tech-savvy Ugandans began warning friends on social media to make sure their VPN apps were updated.